From Evansdale Glen. Route. DOC. Stream crossings. Preferably February when water most likely to be low. Track up Careys Creek alone: an easy walk. Click information on the Seacliff Dam, historical creek track and pipeline. 13. 11/4/2018. Trampers. Evansdale Glen –Rongomai/Honeycomb. M. Leader: Dave. 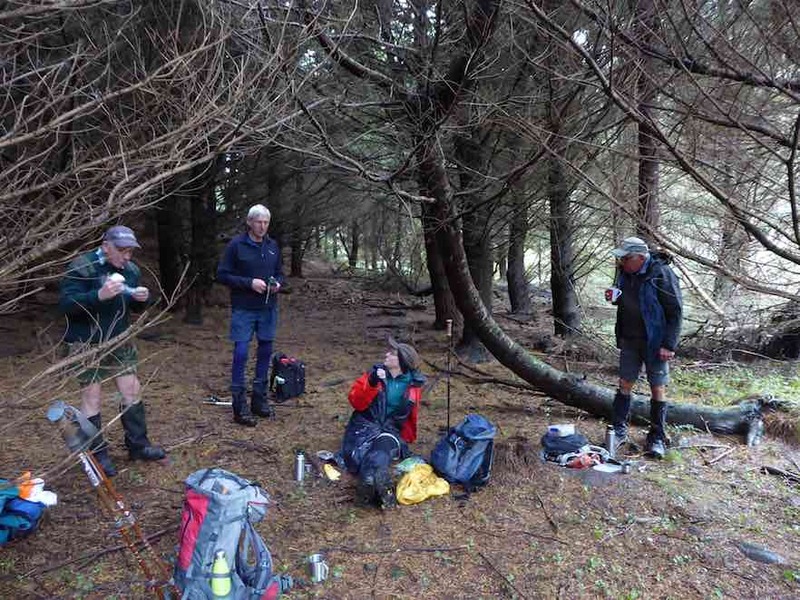 How could 5 trampers’ turn down coffee out with Margreet and Neil and Jill’s fresh hot muffins on a cold wet morning? Well they did! It was off to Evansdale Glen with a little snow on the side of the motorway on the way. The weather cleared a bit as we started. 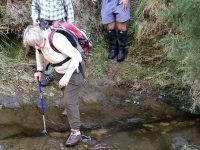 The creek was up after the rain so it was wet socks and boots as we made our first crossing of Careys creek. The discussion then started on having waterproofing on the inside of boots? We were sheltered in the gorge of the creek. 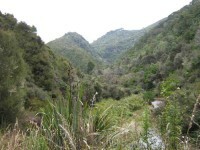 The bird song was very pleasant – bellbirds, tuis, fantails and the odd wood pigeon. At the Honey comb/ Rongomai intersection we decided to take the Rongomai track just to guage how slippery it might be. The track was a little steep to start with. 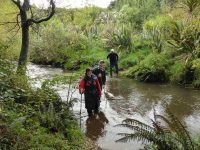 As we followed the well-defined track we walked through very attractive areas of quite big Kanuka with smaller plants of Lancewood, Mapau, Broad leaf and the odd small Totara. Because of the wetness of the track, we took the connecting track to the honey comb track. This was pleasant with the many ferns green and lush. 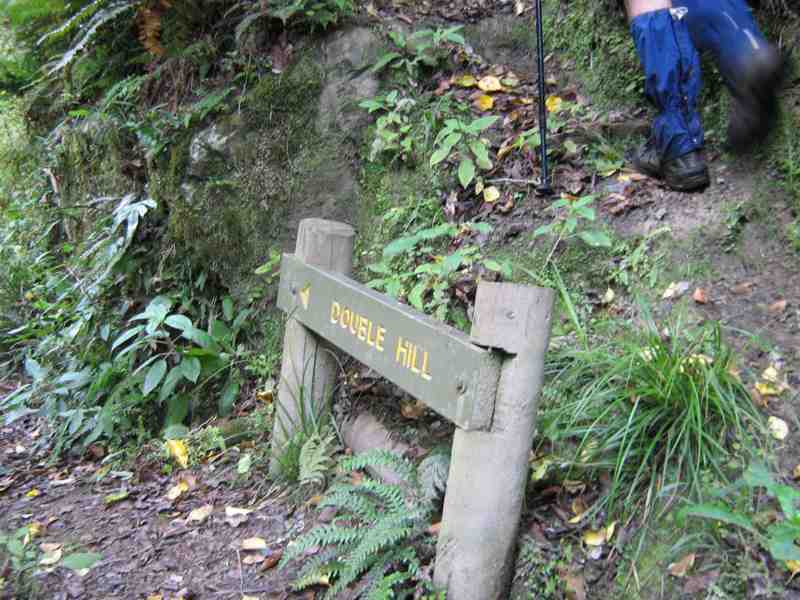 We then followed up to the top of the honeycomb track to meet Semple road. Lunch was had in the shelter of trees and a disused gravel pit at the top. 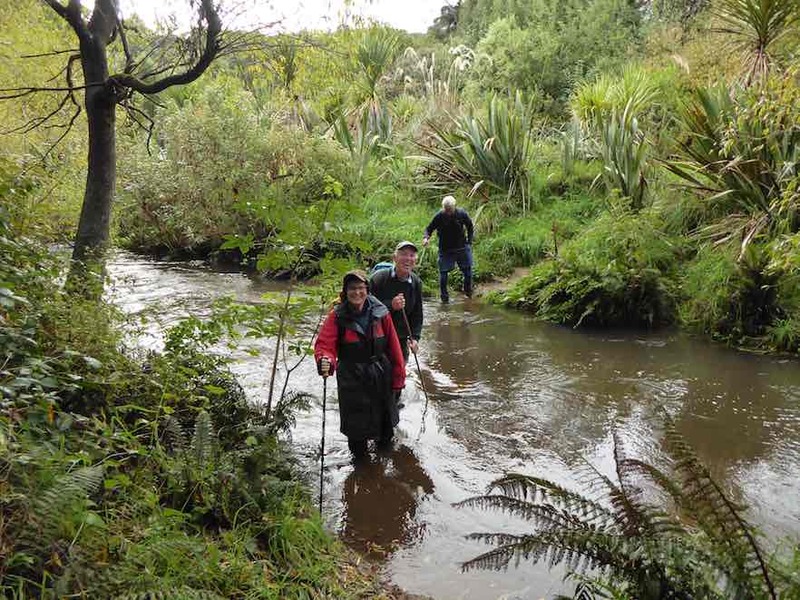 We then followed back down the Rongomai to Careys creek again – illusion the creek seemed to be higher! The leader who shall be nameless slipped on the slippery rocks and got wet! Phil to the rescue. Thanks Phil. The discussion continued on the design of new boots, with a special one way valve and pump to eject the water from within them . Arthur gave us a demonstration. He is now applying for a special patent for boots with these features. 12. 17/8/2016. Trampers. Evansdale Glen, Honeycomb, Rongomai. M. Leader: A Heenan. 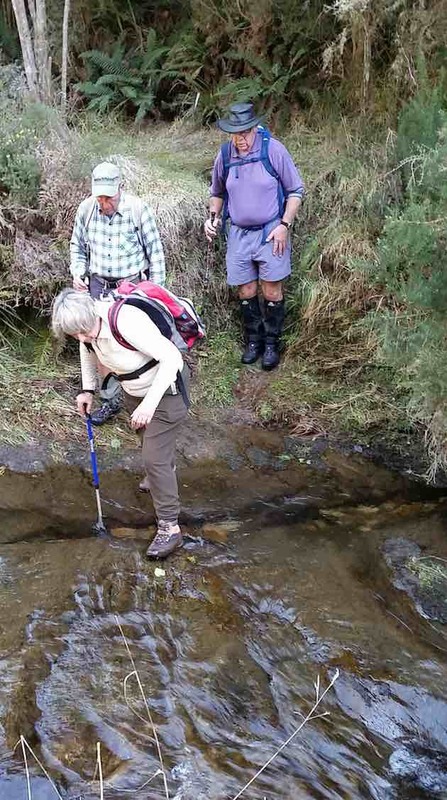 Seven Trampers were delighted to discover that some thoughtful person had placed stepping stones to allow us to cross Careys Creek with dry feet, at the beginning of our day’s tramp. The second crossing also had the stones. It was cold walking up the Careys Creek track in the shade, and with evidence that the frost had not thawed for some days in parts. 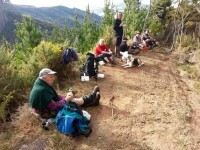 We stopped at the first sunny spot that was encountered to have our morning tea. It was only a very tiny spot, just adequate but welcome for our purpose. Continuing on up this very good track, we eventually came to the junction. 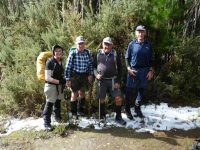 A year ago our group did the circuit in a clockwise direction, so to be different (I like being different), we went up the Rongomai Track. This is always a good dry track, if an energetic climb at the lower end. Turning left we followed “the old nature trail”, the cross track to Honeycomb. This track generally follows the contour, but goes up and down continually, with a number of well placed steps in places. In one place, a large fallen tree proved a little awkward to climb through carefully. Considerable bird song was noted here – Bellbirds and Tuis, etc, and several pigeons were seen. A little Tomtit had kept just in front of us for a short distance, as close as two metres to me. 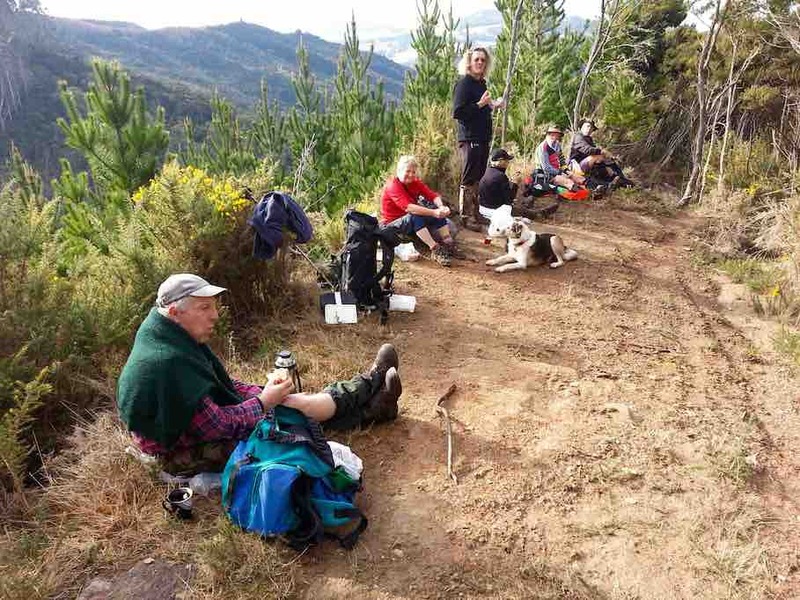 Coming to the Honeycomb track, we turned left again and following it for a short distance, found our lunch spot bathed in sunshine. 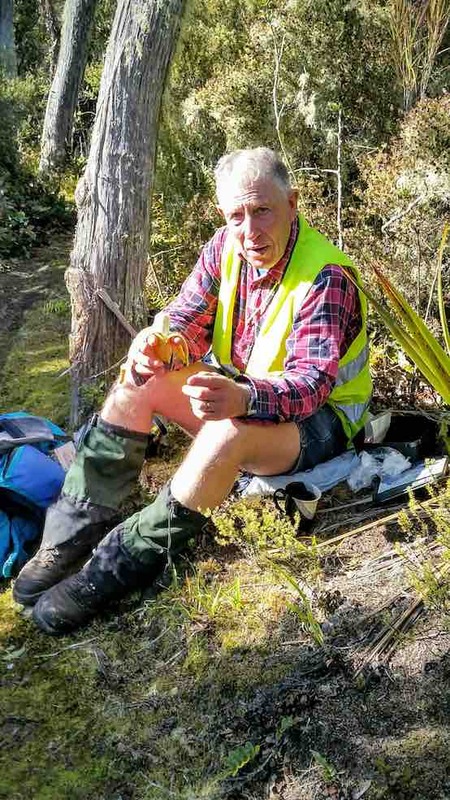 The Honeycomb Track was drier than expected and we made good progress going down, only the last 200 metres or so needing extra care – steeper and wetter here. Following Careys Creek now, the track was quite wet in places and the air noticeably much colder in the gully. There are five river crossings along here on the way back to the Rongomai junction. … One member narrowly avoided disaster. Around a further hour’s tramp returned the group to the cars, having covered 12.4 km. Some members of the group wanted to stop at “Blueskin Nurseries” on the way home. In my simplicity(?) I presumed that the lovely spring-like afternoons of the previous days had brought out the ‘gardening desire’ in some. But the plants and flowers were ignored, the group heading indoors. I tagged along to see what the score was. I soon found that the score was:- 3 coffees, 2 hot chocolates, 1 tea and 1 juice! Discussion followed, and as noted on previous occasions, has a tendency to include food. Today such culinary delights as lamb shanks, pork bellies, pumpkins, sweet breads and tripe were avidly mentioned. Personally I avoid tripe myself, although some may suspect that what I write here is a load of tripe(?). 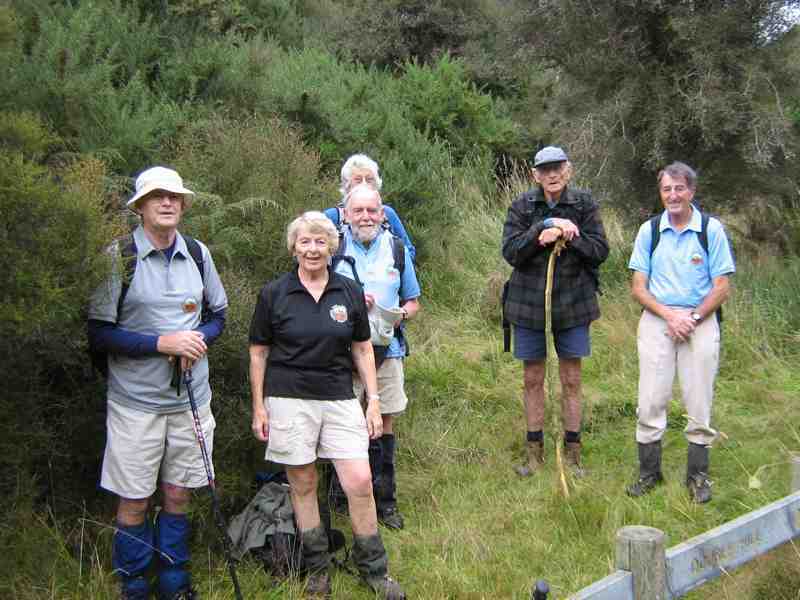 Eventually seven happy Trampers returned to Mosgiel after enjoying a day’s exercise in the sunshine and fresh air. We couldn’t have had a better day out. – Arthur. 11. 12/8/2015. Trampers. Evansdale Glen, Honeycomb, Rongomai. GPS of route, courtesy Ken. 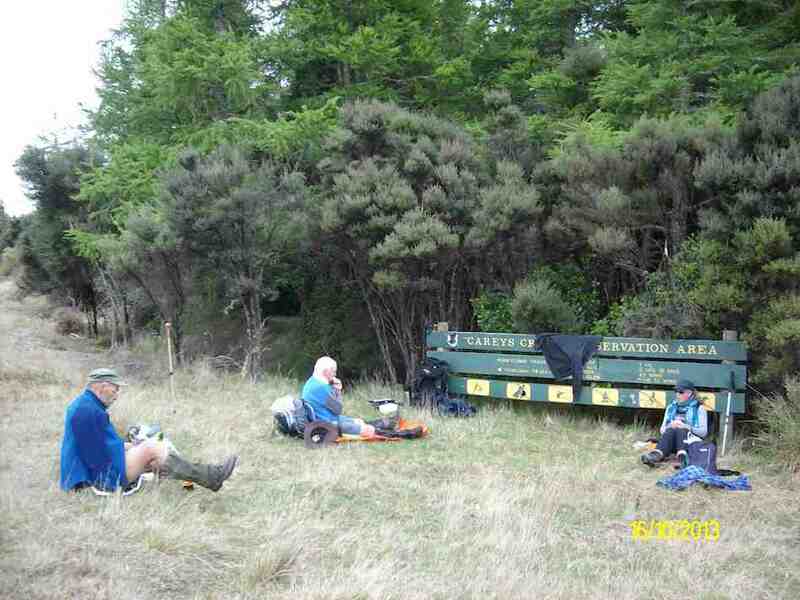 Evansdale Glen Honeycomb joining track Rongomai (Ken pic and caption). Walked 12.4km; 4km/h; 3hr 20m moving; climbed 253m; max height 340m. 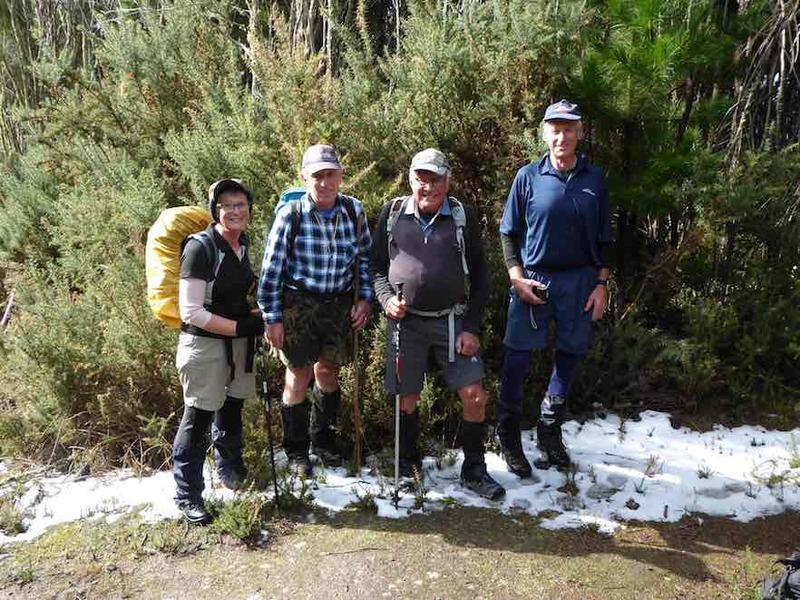 Today’s tramp was to Evansdale Glen, then up Honeycomb, & back down Rongomai tracks.Now normally this is not a problem, BUT there was still a lot of snow on Flagstaff, & around my place on the hill, so I was sceptical about our chances of getting up Honeycomb very far. However, after a bit of a conference among the 7 trampers at the carpark, we decided to go & see what was in store for us. As we got over to the other side of the Northern Motorway, it was a different world, no snow, & everything looked really normal. …in a quite sheltered spot just before entering the bush, but if we had gone a little further, we would’ve found an even better spot!! After lunch we made our way down to the creek at the bottom of the ridge, & back out to the cars. The day was enjoyed by all, especially the ones who had not been in there before. 10. 16/10/2013. Trampers. Evansdale, Careys Creek, Honeycomb, Mountain Road, Rongomai. Medium. GPS of route, courtesy Ken. Honeycomb and Rongomai from Evansdale. 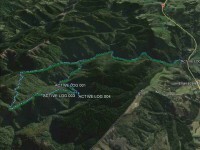 Distance: 11.8km; time: 3hr 3mins; ave: 3.9 km/hr; climbed: 507mtrs; max elevation: 378mtrs. … then walked the couple of hundred mtrs. 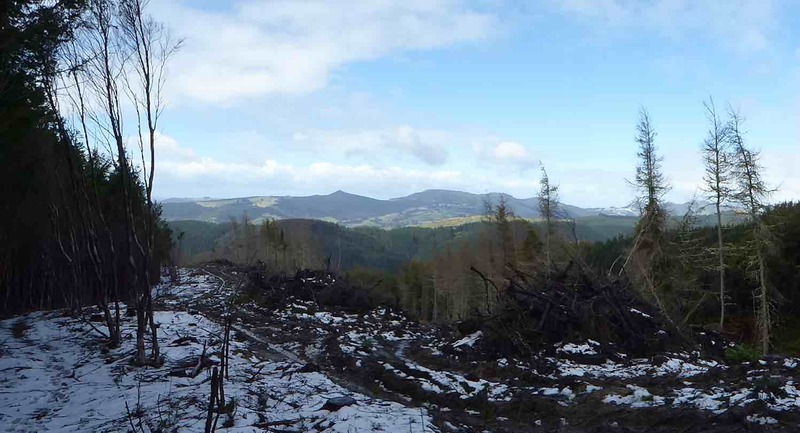 along to the top of Rongamai track, which is now just a forestry rd. This goes down past the shortcut track which goes back across to Honeycomb, & continues for some distance beyond there. 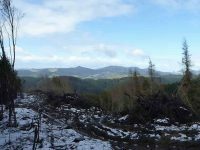 It eventually reverts into the original Rongomai track, which follows a ridge, & then as it gets to the toe of the ridge, it steepens greatly, until the valley floor is reached. From here, it is just a reverse walk along the Careys Creek track back to Evansdale Glen. A good day, with basically no wind, even at Mountain Rd. end, & all 4 of us said it was a good walk, which had never been done by 3 of the party. It was half a tramp, half a blackberry-plucking expedition as Hazel discretely filled a bag for next weekend’s blackberry crumble. Careys creek showed signs of a flood in recent past weeks but its level was down to a tolerable crossing and re-crossing shallowness. A notable hurdle was Bill’s aptly-dubbed “Beaver Dam” at the second crossing which we made by precariously struggling over small and large fallen branches. The first pic shows Rongomai Ridge ahead of us. A little while later we reached the junction heralding the beginning of the loop we had decided upon doing clockwise. The next pic shows the beginning of the steep climb out of Careys Creek up the beginning of the Honeycomb track, a climb during which at least two of the seven strong group vowed that this was their last tramp here. 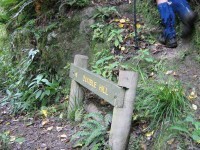 Start of Honeycomb steep climb from Careys Creek at Double Hill route sign. 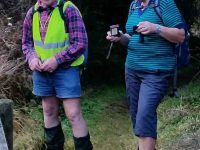 Bill – well, his boots and gaiters. We made it across the ridge at the top of the climb and then on further up to the Mountain Road exit. A short walk up the road and it was into and down the Rongomai with a large expanse of clear-felled forest to the left. Back down to Careys Creek and the blackberry plucking continued with George assisting Hazel, with his long picking-pauses on the trip back filling a hefty bag of berries. The high-light/low-light of the tramp towards its end was Hazel wrenching an ankle, which proved to be a broken fibula at the ankle on inspection the following day, leading to six weeks in plaster. 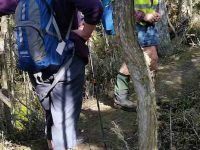 However she bravely continued to limp along with the benefit of two trekking poles, even to the extent of four of us tackling an exploratory Beaver Dam by-pass track on the creek’s true right, a rather hair-raising steep up and down track in places, never to be repeated again. 7. 16/11/2005. Trampers. Honeycomb, Rongomai. Medium. Bob H, Ian. 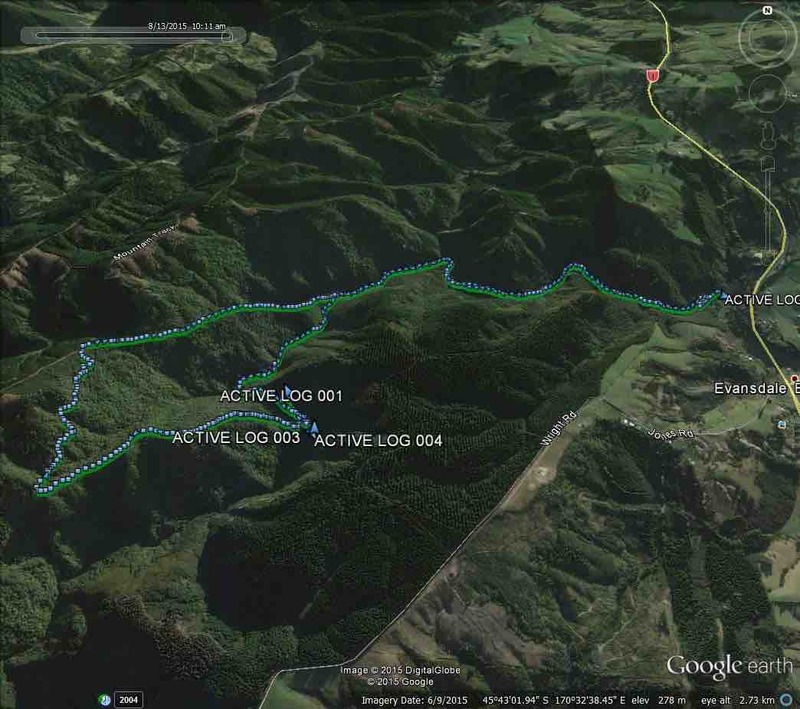 Took the Evansdale Glen Track to Rongomai Track. Great Track. Spectacular views. 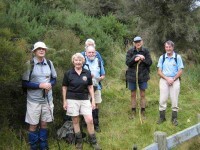 Got to the Intersection where a sign said Rongomai Track but nothing to say which way to go to Honeycomb Track. Needs to be another sign there with Honeycomb Track on it. [Honeycomb Track sign both further up the stream, and up the Rongomai. It links the two! – Ed.] Lovely track through the bush but then when you get to the intersection the sign is not very clear and is hard to read so the sign needs to be clearer to read Honeycomb Track. When you get down to the bottom where the sign says Double Hill and the track bares right up Double Hill there needs to be a sign saying Evansdale Glen Track left. We had a GPS with us so we didn’t have a problem but it could be a bit difficult for people that don’t have a GPS. Otherwise fabulous bush walk.